The Sacred Liturgy of the Church—Sunday Mass, daily Mass, funerals, weddings, and other celebrations you may be serving—is the public prayer of the Church. The server assists in the handling of the Missal book for prayer times, the sacred vessels for the altar, and the processional pieces, such as the cross and the candles. This role greatly assists in the beauty and functionality of the Mass. It is a great honor and privilege to serve at Mass. Be aware of when you are scheduled to serve Mass. Schedules are made usually for a six to seven week period. Servers are important for the celebration of Mass. If for a good reason you cannot come, it is your responsibility to find your own substitute. Please arrive at least 15 minutes before Mass. Sign in! (The sign-in book is on the sacristy counter.) Immediately after sign-in, put on an alb and cincture that fit and be prepared to help set up. Stay after Mass to help clean up. Dress up for Mass when serving: neatly and modestly. Gym shoes, sandals, flip-flops, shorts, t-shirts, and tank tops are not permitted! Make sure you are wearing dress shoes, your hair is combed, and your hands and fingernails are clean. Girls and Boys in at least the fourth grade are welcome to train to become altar servers at St. Michael Church. Adults are also welcome to minister as servers. They greatly help at 7:30 AM Mass on Sundays, at funerals outside the school day, and on other occasions when needed. AT THE PARISH OFFICE (330-492-3119). AT THE PARISH OFFICE (330-492-3119, ext. #222) or pat@stmichaelcanton.org. The ministry of lector requires an interest in good liturgy, a love of scripture and an understanding that Scripture is the living Word of God, an appreciation of language, words and speech techniques, and a desire to proclaim the Word of God with life, energy, enthusiasm and intelligence. Lectors read at Masses and on other occasions such as Morning and Evening Prayer, Communal Reconciliation Services, etc. Formation workshops for new lectors are offered, usually, every eighteen months. The workshop consists of three 3 hour classes, one each week for three consecutive weeks. A person must attend all three sessions in order to be commissioned as a parish lector. Lectors also are expected to participate in meetings dealing with procedures as well as in gatherings for ongoing spiritual renewal and formation. The basis of the Ministry of Hospitality (USHERS AND GREETERS) is to make people feel welcome. Greeters and ushers create an atmosphere of hospitality, as people enter the building, by welcoming them warmly and making them feel at home. 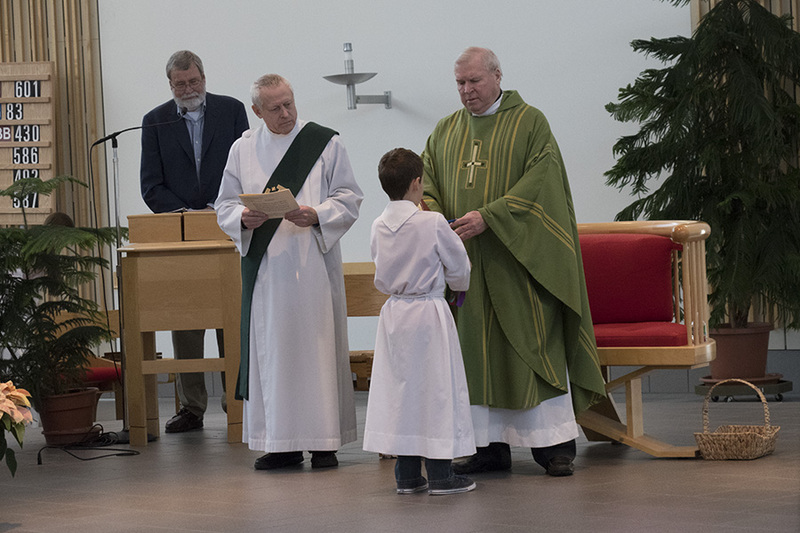 Ushers also attend to various functions throughout the liturgy to make the community feel comfortable and to assure that the many aspects of the liturgy flow smoothly. Requirements include a strong sense of community and a desire to enable each person to celebrate the liturgy to the fullest. Ministers of Hospitality are expected to participate in any meetings, as well as in gatherings for ongoing spiritual renewal and formation.